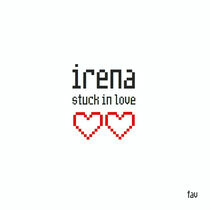 ‘Stuck In Love’ is the debut solo single from Ukrainian singer/songwriter Irena, produced and mixed by Julian Bendall (Bah Samba) and Mark Ralph (Filthy Dukes/Hot Natured) for Favouritizm. The track sees Irena deliver a distinctive, heartfelt vocal, telling a love story, underpinned by a warm backdrop of retro electronica, fused with lush deep house sensibilities. Joining forces on remix duty are Italian producer Alex Vanni and Fav’ label boss Sarah Favouritizm, who crank up the thermostat and drop a cinematic ‘80s synth electro-pop / nu disco flavoured remix. Topping off the package, is a remix from Italian deep house producer Aki Bergen. Irena, born in the Ukraine, studied music in Manchester where she is now a popular fashion blogger. Being a classically trained jazz singer her compositions are full of dark energy and ‘90s sounds, European epicness and seductive ‘80s glam. After her previous synth – pop project Rubika, Irena decided to experiment with fusing the elements of electro and Eurodance into dance music. The results are a combination of cold electronic harmonies, lush rhythms and sultry power vocals. Good friends Julian Bendall and Mark Ralph have worked for many years together in music, namely in the highly acclaimed UK band, Bah Samba, but also lending their individual musical talents to countless band projects, productions and remixes under many guises. Italian producer Alex Vanni is deeply inspired by the Chicago/Detroit electronic music of the late-80s and early-90s. In 2005, Alex, as Mono, together with DJ Tony Barbato, released ‘Flowers’, with supporters including John Digweed, Alex Neri, and Steve Lawler. He has remixed everyone from Adamski, Pastaboys and Roger Sanchez. Sarah’s production projects include Rise ‘The Way We Get Down’ with Timmy Vegas and remixes for Bah Samba. Both sharing a love for vintage analogue sounds and electronica, 2014 saw Alex and Sarah team up on some new production and remix projects, with ‘Stuck In Love’ being their first fruit. Mix engineer, composer and producer Aki Bergen, aka Simone Bocchino is on his game when it comes to producing Italian deep house. He has graced the no.1 spot on the Deep House Beatport chart many times, including their main chart with the track ‘Jazzy Stuff’.